Dining out • Eatery's new menu, sumptuous dishes show it is ready for a different era. Paul Fraughton | The Salt Lake Tribune The bar at Layla Mediterranean Grill and Mezze in Holladay. The Tadros family has transformed their former Confetti's restaurant in name and menu to a gorgeously decorated and sumptuously flavored Mediterranean restaurant. 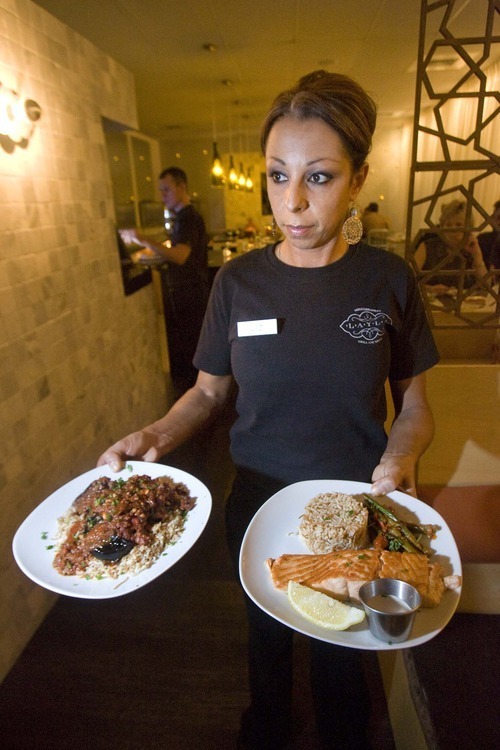 Paul Fraughton | The Salt Lake Tribune Liz Tadros delivers an order of Lebanese moussaka and fresh king salmon recently at Layla Mediterranean Grill and Mezze in Holladay. The Tadros family has transformed their former Confetti's restaurant in name and menu to a gorgeously decorated and sumptuously flavored Mediterranean restaurant. 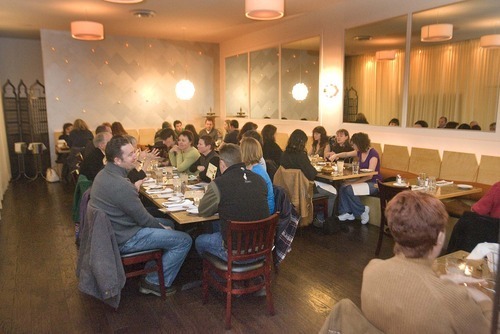 Paul Fraughton | The Salt Lake Tribune The main dining room at Layla Mediterranean Grill and Mezze in Holladay. The Tadros family has transformed their former Confetti's restaurant in name and menu to a gorgeously decorated and sumptuously flavored Mediterranean restaurant. 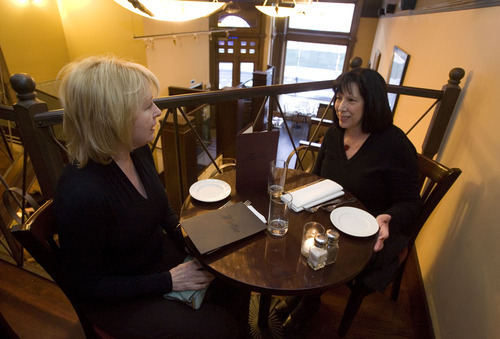 File | The Salt Lake Tribune Loretta Duncan, of Heber, left, and Marylou Mayer, of Clinton, chat at the Martine Cafe. Paul Fraughton | The Salt Lake Tribune Safa Riadh brings out an order of red pepper hummus and muhammara walnut spread at Layla Mediterranean Grill and Mezze in Holladay. The Tadros family has transformed their former Confetti's restaurant in name and menu to a gorgeously decorated and sumptuously flavored Mediterranean restaurant. 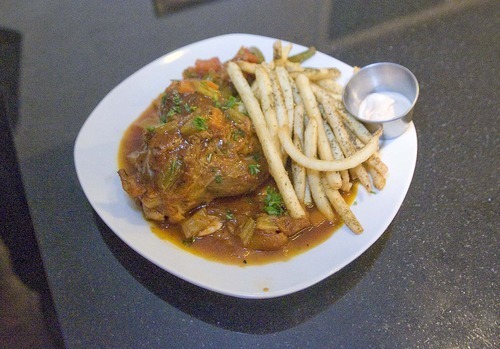 Paul Fraughton | The Salt Lake Tribune The Moroccan lamb shank at Layla Mediterranean Grill and Mezze in Holladay. The Tadros family has transformed their former Confetti's restaurant in name and menu to a gorgeously decorated and sumptuously flavored Mediterranean restaurant. Paul Fraughton | The Salt Lake Tribune An order of Layla's signature fries with harissa "toum" aioli at Layla Mediterranean Grill and Mezze in Holladay. The Tadros family has transformed their former Confetti's restaurant in name and menu to a gorgeously decorated and sumptuously flavored Mediterranean restaurant. Paul Fraughton | The Salt Lake Tribune The Tadros family has transformed their former Confetti's restaurant in Holladay in name and menu to a gorgeously decorated and sumptuously flavored Mediterranean restaurant. Holladay • You can count the number of Middle Eastern restaurants along the Wasatch Front with one hand. Any Mazza buff would be hard-pressed to name another venue with similar expansive offerings of everything from hummus to schwarma. 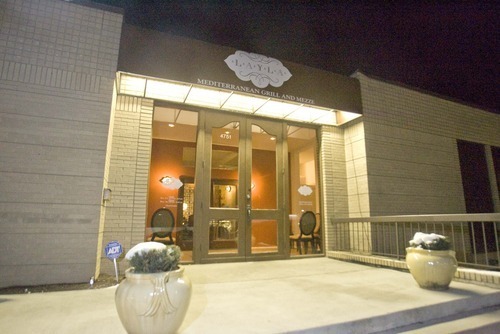 Here's one for you: Layla Mediterranean Grill and Mezze, which is new, or at least newly re-tooled. And despite what the name might suggest, it features the flavors of the eastern and southern shores of the Mediterranean. The space was once Confetti's. The owners, Raouf and Layla Tadros have been in the restaurant business for 16 years offering Italian food that was convenient, but forgettable. Now, as the owners of Layla, the Tadros' showcase authentic flavors (he's from Egypt, and she's from Lebanon) they've been cooking in their home. Once you walk through the lobby into the dining area, a beguiling scent that's a mix of garlic, olive oil, cumin and coriander hits you. I don't know why it has taken them so long to share these flavors with diners, but all I can say is: It's about time. From the street, you can't tell the changes that have taken place. Inside, there aren't many traces of the old Confetti's dining room in sight. First there's that scent, while the décor provides a whole new vibe. The interior has been updated into a sophisticated and modern den, swathed in white, light, and texture from the flowing sheer curtains, fixtures and fabric. 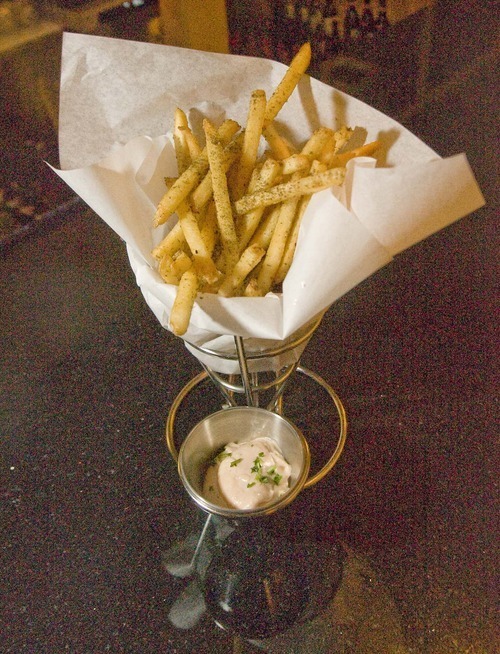 The bar bustles with casual diners nibbling on the signature fries ($4), dipping the spiced sticks into harissa aioli. The bartender, too, dabbles in the fiery spice paste, shaking it into a delicious harissa Mary cocktail ($7.50). Below the chatter of diners, you'll hear a Middle Eastern soundtrack that ranges from traditional Lebanese ballads to hip-swaying drum loops. It's as if you've been transported into a hip district of Beirut, when it was considered "the Paris of the Mediterranean." 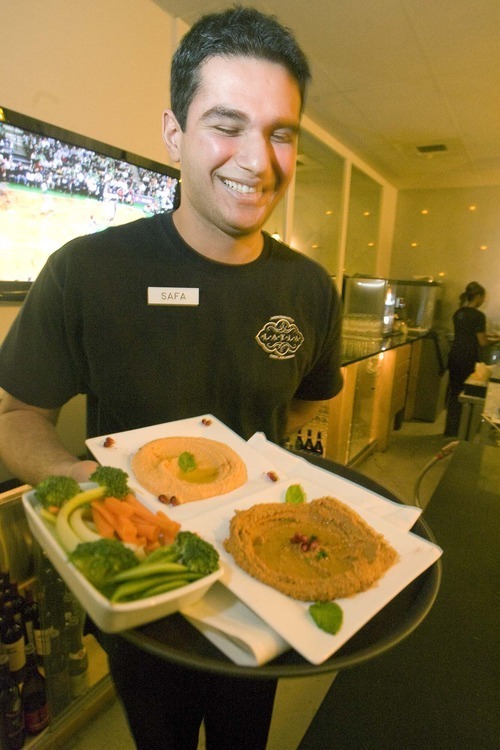 Waiters, including the Tadros' three children, offer quick and casual service. On one night, daughter Liz helped us navigate the terrain of the new menu, steering us toward a variety of mezze, small plates and appetizers, that we could share. These included a simple but satisfying salad of salty, squeaky halloumi, fried cheese over lightly dressed greens ($7) and the flatbread mezze ($5-$8). The za'atar herb ($5) was our favorite  dried thyme, ground sesame seeds and tart red sumac berries adding a lot of subtle flavors to the bread. There are a few throwbacks from Confetti's menu. For instance, as we were enjoying the za'atar flatbread along with lahm bi ajn flatbread (ground lamb) ($6.50), and fitayer spinach pie ($6), we were offered standard dinner rolls with pats of butter. It seemed redundant and unnecessary, taking focus off of the lovely new starches that outshined the standard roll. Perhaps they want regulars to feel at ease. Maybe one day, they'll let the rolls go. They'd be better off for it. 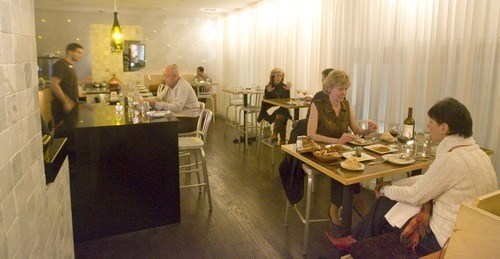 The menu's signature dishes are heartier … and where Gorgonzola suddenly comes into the picture on a rib eye ($26). Why go for a so-so rib eye when there are entrées like the Lebanese moussaka ($10, $14), with layers of tender eggplant, ground beef, resiny pine nuts and spices? The bed of pilaf , or vermicelli rice, beneath the eggplant is rich and flavorful. Likewise, the kebab platters ($14 to $16) are abundant with your choice of ground lamb kefta or Morgan Valley lamb morsels and tahini (sesame paste), garlic and lemon sauce. The real delight here is grabbing a quick light meal or an extended meal over a series of the mezze. Creamy hummus ($6), smoky baba ghanoush (roasted eggplant purée, $6) and the muhammara ($7.50), which blends pomegranate molasses with walnuts, are perfect for dipping pita that arrives gently warmed in a taginelike earthenware pot. Grape leaves ($6) are tender and feature a warm interior of lemony soft rice, mint, parsley and olive oil, tasting like little packages of sunshine. Kibbeh ($7) arrive piping hot from the fryer, ready to dip into the mint yogurt sauce. The crab cakes ($6) were perhaps the most surprising. I thought initially it was a concession to the Confetti's legacy. But the soft, fresh crab meat was perfectly seasoned with a delicate echo of cumin and was served with a nicely balanced remoulade. It paired nicely with the Layla Rose cocktail (vodka, rosewater and lime juice, $7.75). One night, I noticed both Raouf and Layla Tadros surveying the bustling dining room with tired and slightly worried faces. They took a gamble transforming a sleepy stand-by into this vibrant venture. But in every way, Layla in its first few months already feels more natural and more authentic then Confetti's ever did. Layla adds flavor and variety to a neighborhood that could use a good dose of both. And judging by the steady crowds during my visit, the gamble is already paying off. The former Confetti's restaurant transforms in name and menu to this gorgeously decorated and sumptuously flavored Mediterranean restaurant. Mezze, such as the grape leaves and halloumi cheese salad, are delicious. Hours • Monday to Friday, 11:30 a.m. to 2 p.m., 5 to 10 p.m.; Saturday, 5 to 10 p.m.